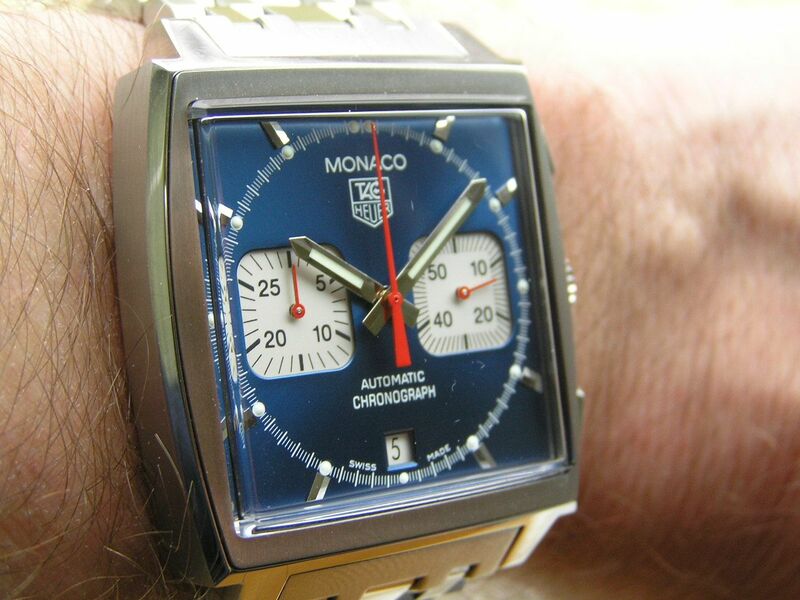 There are plenty of iconic watches around in the 21st century (Rolex Submariner, Omega Seamaster, Zenith El Primero just to name a few) and the Tag Heuer Monaco chronograph is another watch that fits this moniker perfectly. This model was made famous in 1970 when Steve McQueen wore it during the film ‘LeMans.’ And the rest, as they say, is history. The Monaco chronograph reviewed here is the second most recent iteration of this classic watch and I feel it bears more resemblance and authenticity to the original versus the latest version. Let me explain. The newest version of the Monaco chronograph features a slightly larger case (by about 1mm width and height), a sapphire crystal, a display caseback, more dial printing and higher water resistance. While these are all nice features and add more value to the watch, these features were not on the original. The newest version also has a slightly fancier movement with more decoration (55-jewel Caliber 12), but is still a bi-compax chrono module design. I could go on and on about all the differences, how the watch has evolved over the years, etc., but it would be too laborious and not terribly exciting unless you have a fetish for Swiss automatic movements. 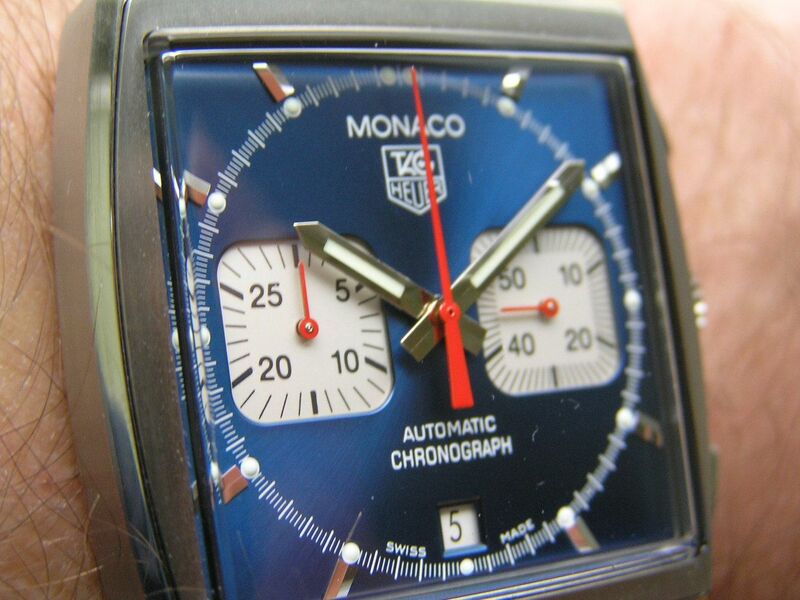 Suffice to say that the Monaco is a classic and that you should buy one at some point. 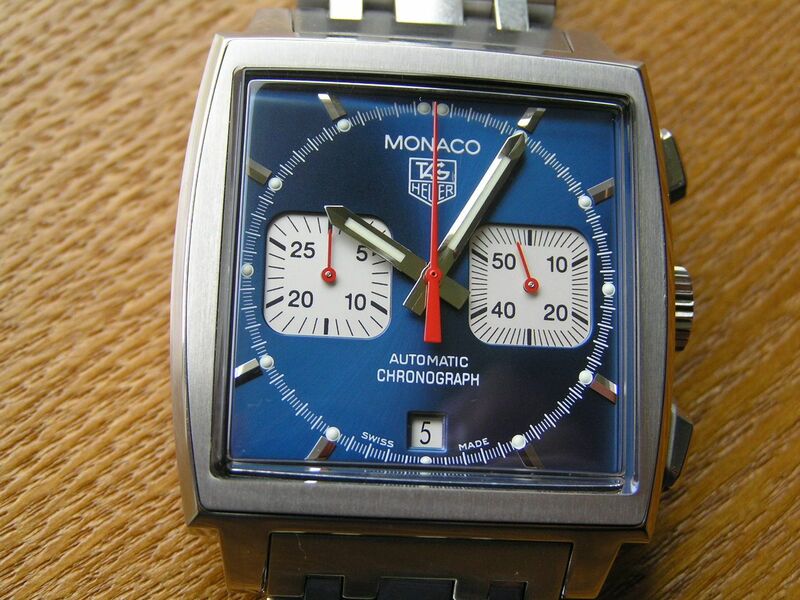 Another nice thing about the Monaco series is that it comes in a variety of styles, both chronograph and non-chrono versions, in different color dials, straps, etc. plus models for the lady in your life as well. The limited edition Gulf model from a few years back is super cool if you can find one. My Monaco has a base ETA 2892 movement with the Dubois Depraz chrono module for a total of 37 jewels, called the Caliber 17 by Tag Heuer (ETA 2894-2 in ETA’s parlance), and none of the other features just mentioned on the newest version. The slightly smaller case size, the plastic/plexi crystal, modest water resistance and solid caseback harkens back to the originality this model possessed in 1970. 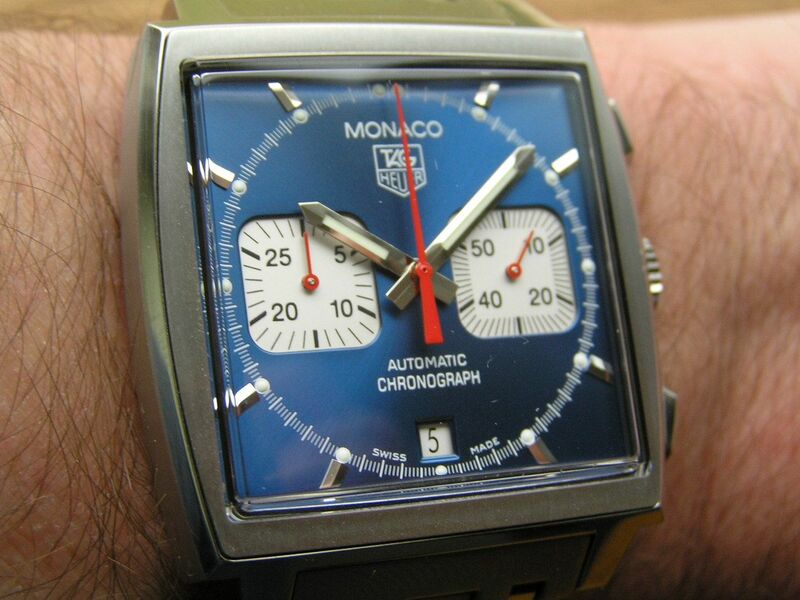 Don’t get me wrong, either version of the Monaco is superb, but I do like mine better. 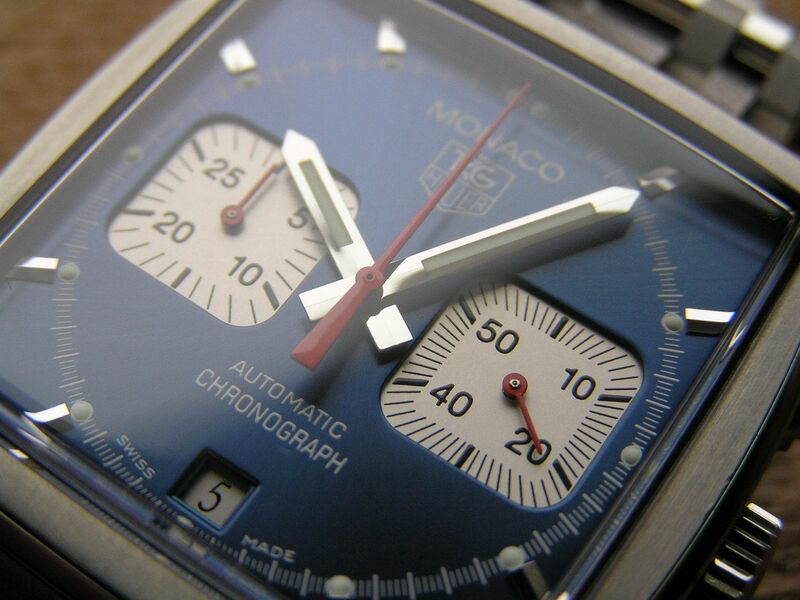 Measuring 38mm square, the Monaco is a near perfect size in this age of overly large timepieces. A square watch usually wears bigger than a round watch of the same size, but the Monaco does not wear large, it just sort of plants itself on the wrist in the perfect spot for admiring glances from WISes and civilians alike. It’s a great fit. Lugs are 22mm, case thickness is 12.9mm. I got mine on the stainless steel bracelet for a couple of reasons, although this does not jive with my penchant for the 1970s version, as that one came on a strap. 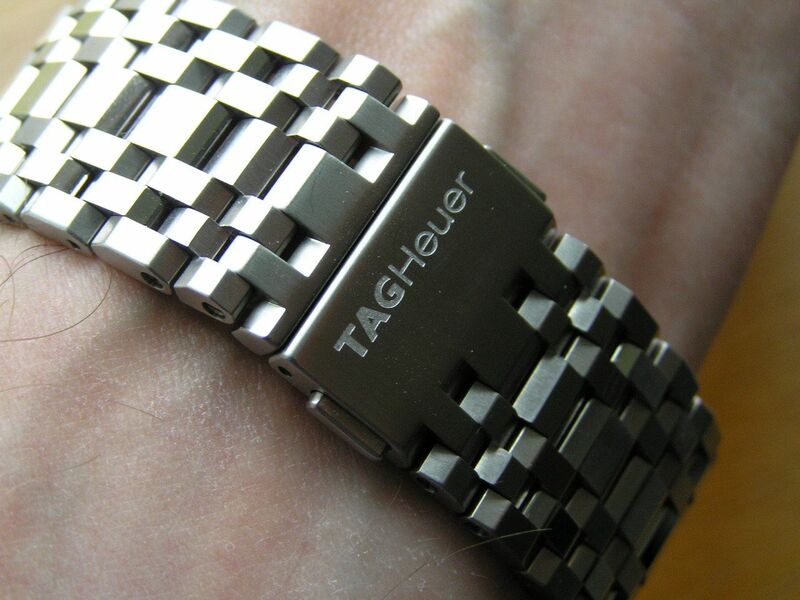 If I have the choice between buying a particular model watch on a bracelet or strap, I prefer to buy a watch with its OEM bracelet (if offered as such) because it is always easier to take off the bracelet if I decide I don’t like it and get the OEM strap or a high-quality aftermarket strap, whereas getting an OEM bracelet can be very expensive (the Monaco bracelet goes for around $500 USD). Oftentimes, the cost difference between the strap version and the bracelet version of a watch is much less than having to buy the bracelet separately afterwards. 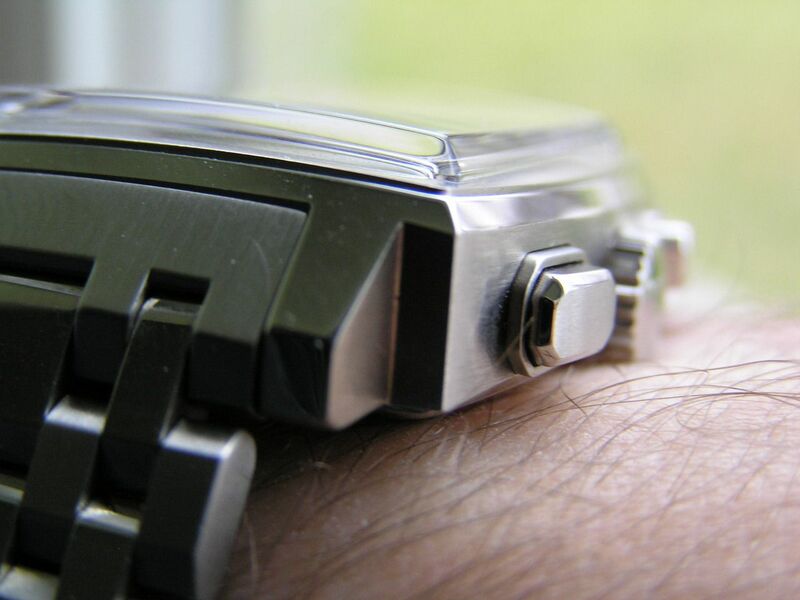 And aftermarket bracelets just don’t do it for most watches and you’ll most likely have problems fitting the end links to the case with an aftermarket bracelet. The Monaco’s stainless steel case is brushed and polished and has great angles and thicker lugs that compliment its square shape. 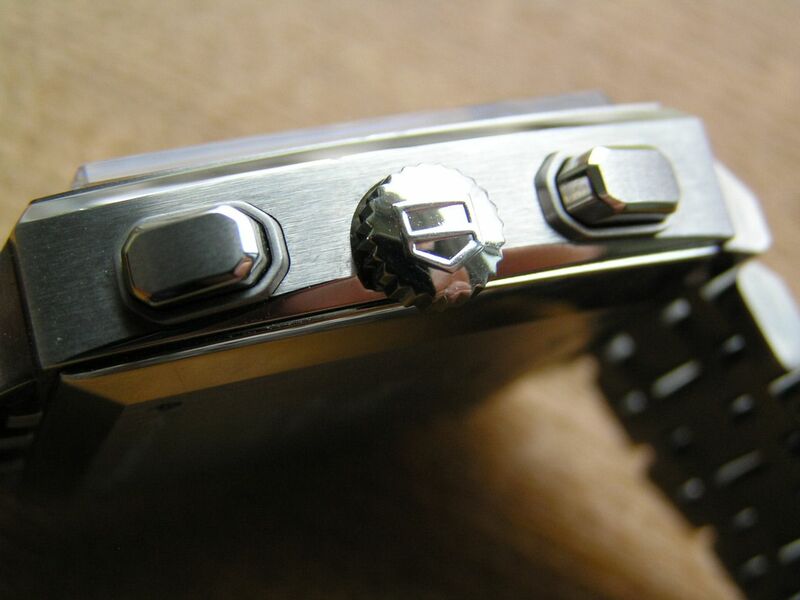 The caseback is also brushed and polished stainless steel and is secured by four small screws. 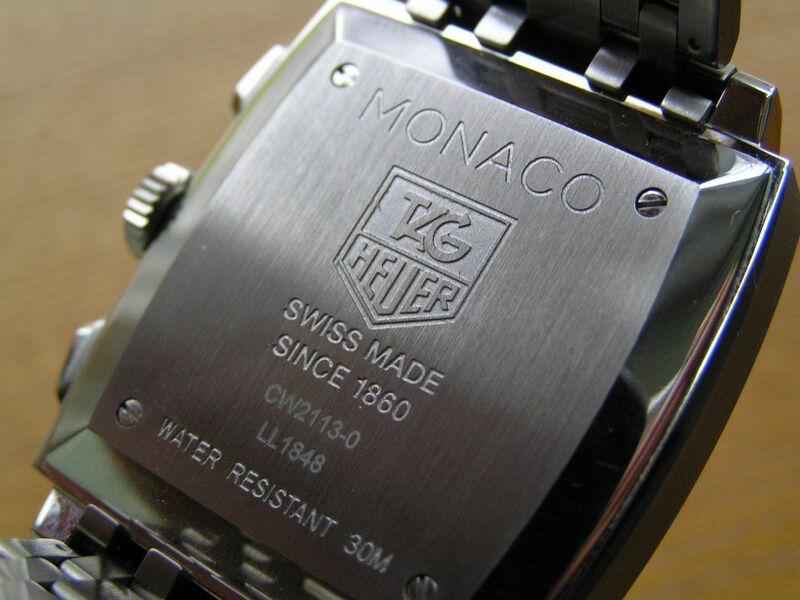 The Tag Heuer logo is engraved on the caseback along with the word ‘Monaco.’ The quality of the case finishing is top notch, with beautifully smooth brushed surfaces and an overall good heft and feel. The bracelet is a relatively simple seven-link design that has brushed and polished features, with a signed pushbutton clasp with signed machined deployant. There are no micro-adjustment holes on the clasp due to its design, but the bracelet links are narrow enough (almost half-link in size) that a good fit should be fairly easy to achieve. 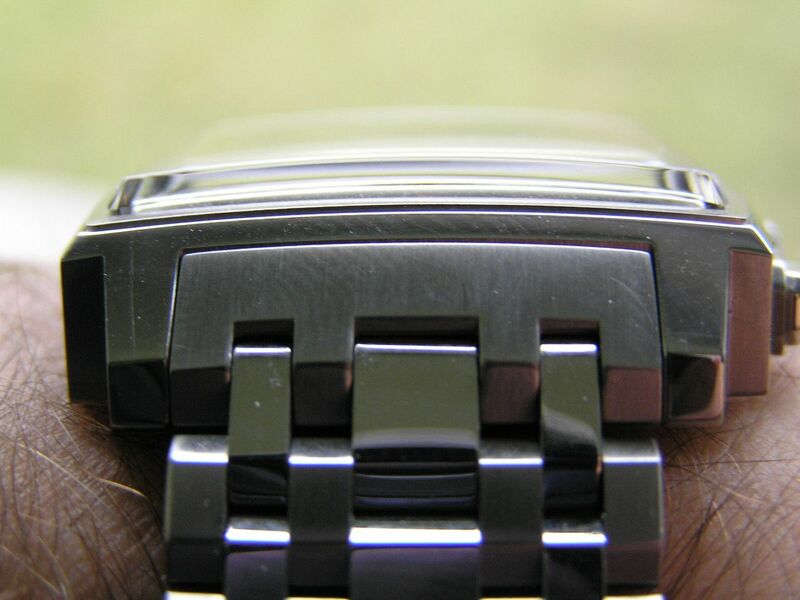 The narrower links and their multi-piece design also give the bracelet more wrist-hugging capability for a better fit. The end links are solid and there is almost no taper to the bracelet, it measures 22mm from the lugs to 21.4mm at the clasp. 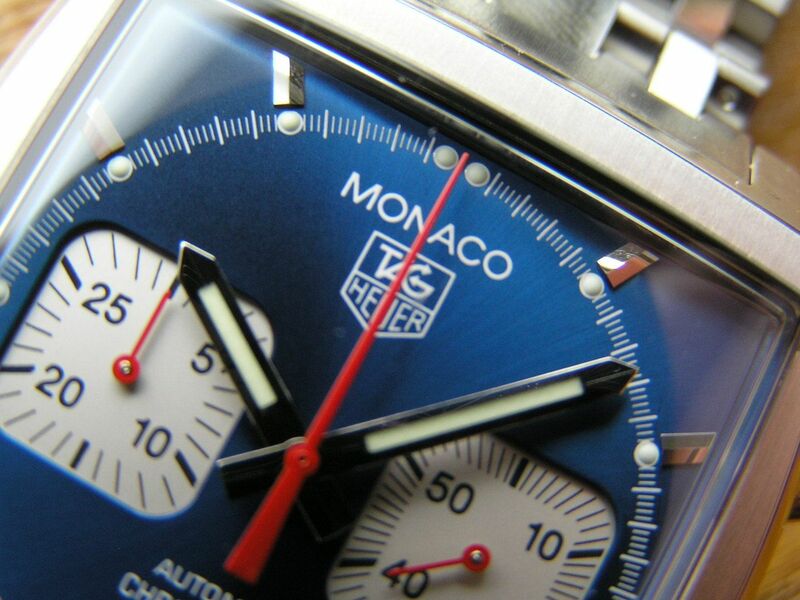 I like the look of the bracelet on the Monaco, while others may prefer the strap versions. You can also argue that this watch screams for a rally-style strap, which I will agree with. 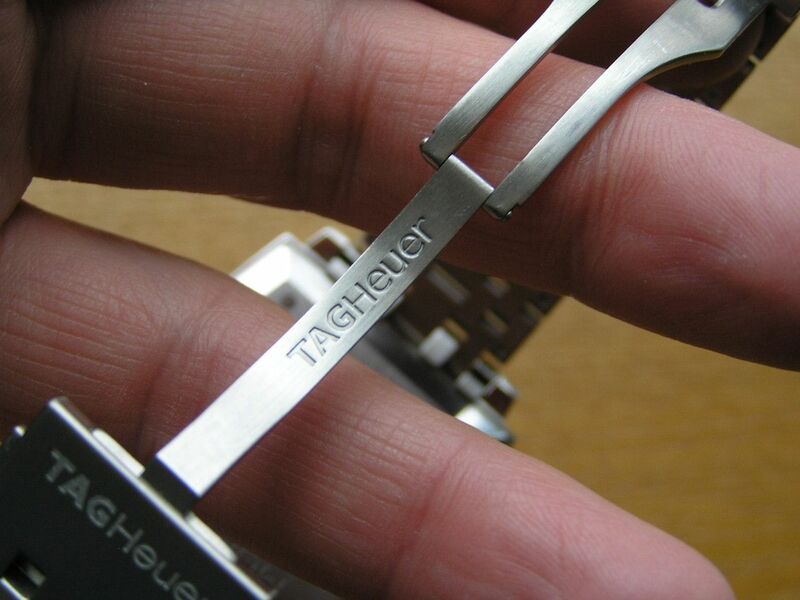 The crown is signed with the Tag Heuer logo and does not screwdown. The watch is factory rated at a rather modest 30M water resistance. The square crystal is plastic/plexi and has a mild curvature to it with slightly beveled edges. So far it has remained scratch free even though it protrudes above the case by a millimeter or so. I baby my watches and don’t wear them often enough to get much in the way of wear on them, so I’m probably not the best spokesperson for those who tend to scratch their crystals. I could see the advantage of the sapphire crystal on the newest model, as I’m generally not a big fan of plastic or acrylic crystals, but on this watch, the plastic works for me and adds to the retro feel. The dial is a stunning shade of blue with silver hands with inset lume. 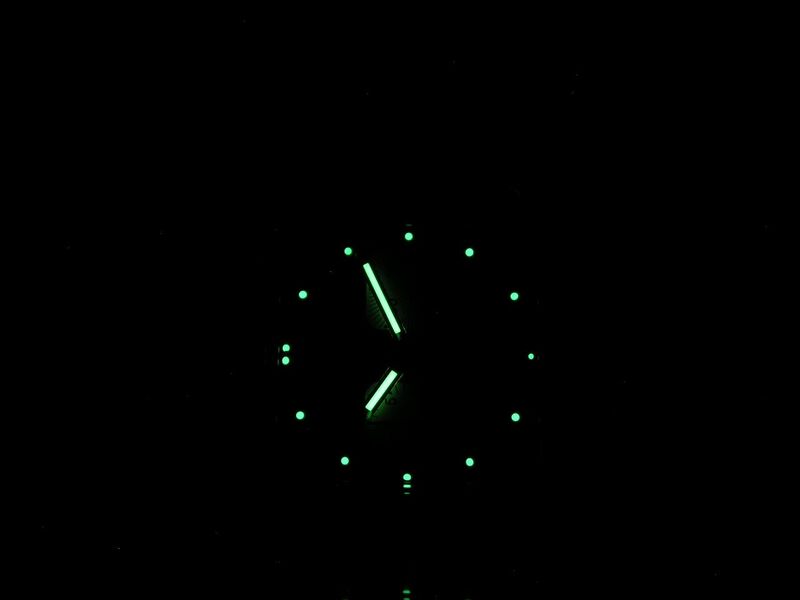 Lume quality is very good, as it should be at this price point. 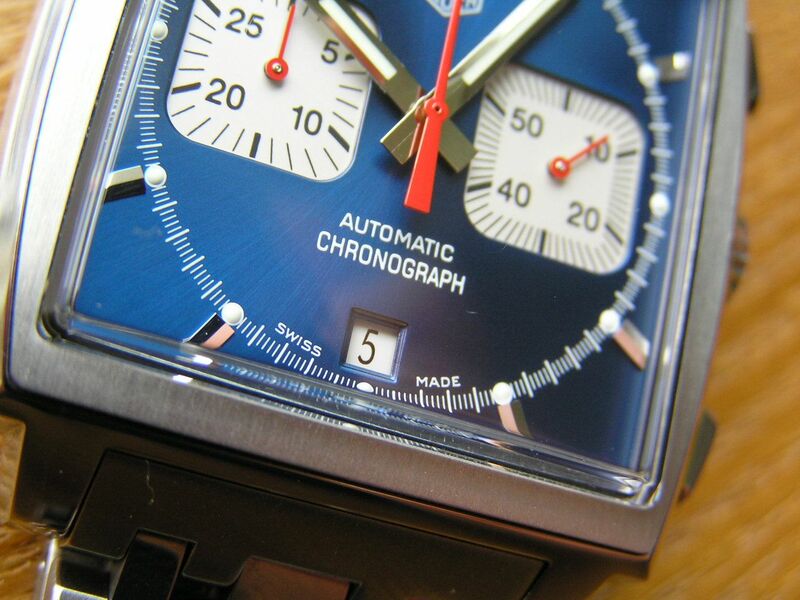 The quickset date display is at the bottom of the dial at the six position. The date window is not large by any means and sometimes the date numerals seem to just fit inside the opening. 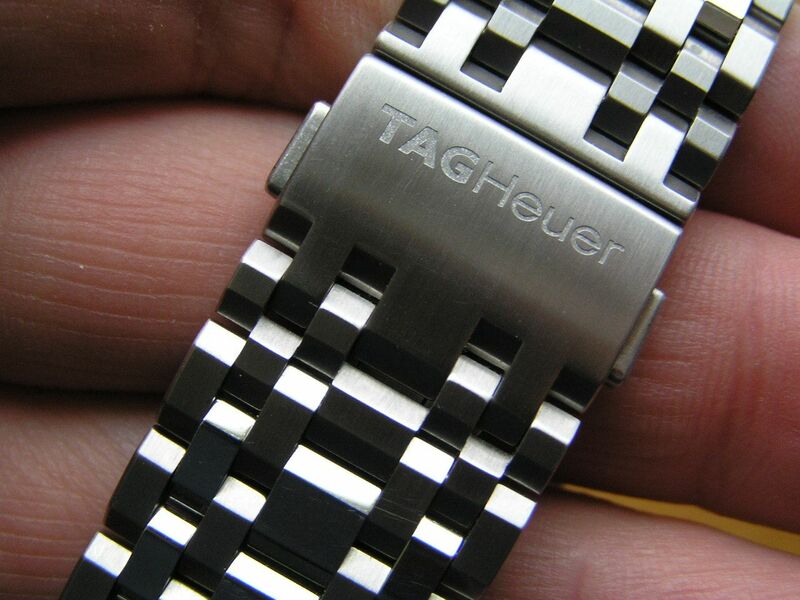 Simple silver markers are applied around the dial, except at the quarter hours, where small lume dots are found, with a double lume dot at the 12. The white chronograph subdials are square and are fairly easy to read, due to their slightly larger size and vivid red hands. The subdial on the right is the watch seconds hand, while the left subdial is the chronograph’s 30-minute totalizer. A red center seconds hand is the chrono’s second hand. 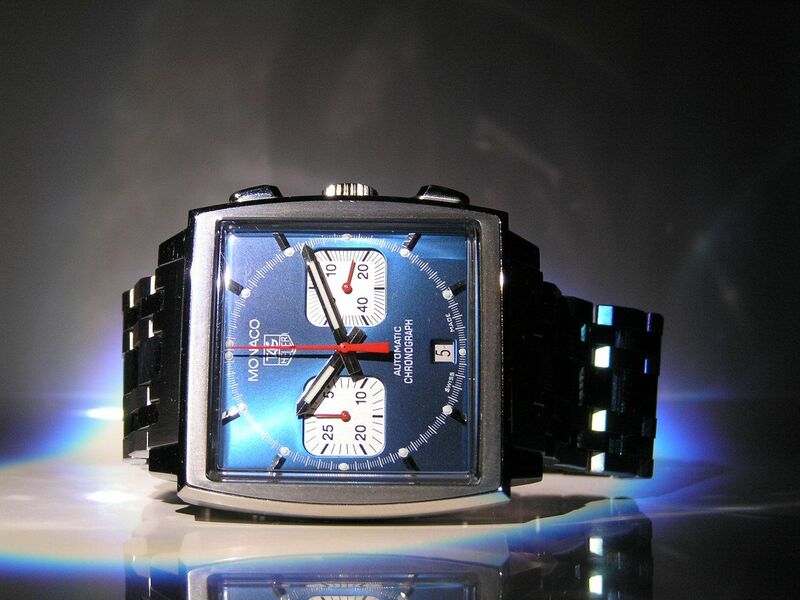 The chrono pushers are rectangular and have a great look and feel, as they have a firm, audible click to start, stop and reset the chronograph. The Caliber 17 movement can be manually wound and hacked and during testing, it turned in a fine 48 hour power reserve with exceptional accuracy, running less than +2 seconds per day and at times since, even zero seconds per day. Impressive! Presentation is standard Tag Heuer, with a black leatherette inner box and black cardboard outer box, with a leatherette document holder. 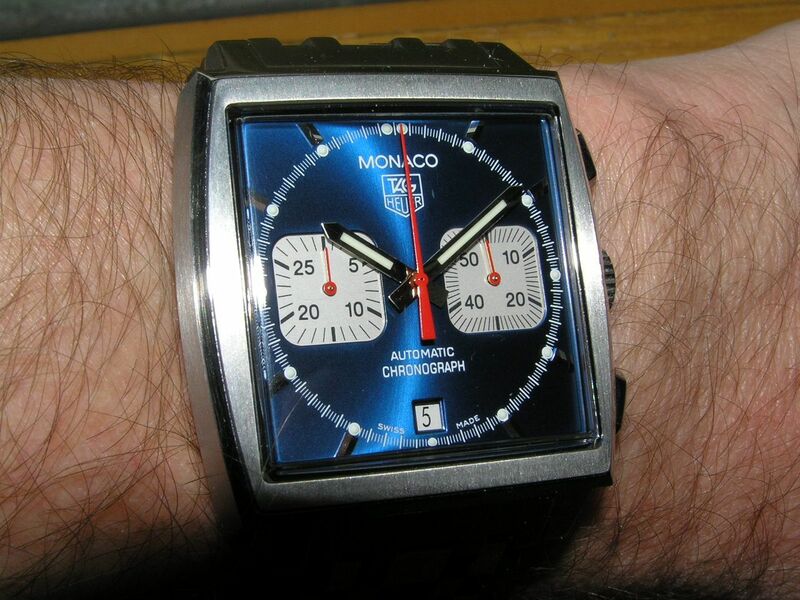 Overall, the Tag Heuer Monaco is an icon among Swiss chronographs and if you like icons, racing, Steve McQueen, square shaped watches or just a quality, cool looking watch, the Monaco will fill the bill for you. Recommended in every way. Verdict: I keep saying it, but it’s an icon, a classic and a damn good watch! Brilliant review. Must admit it was the final push into buying one of these. Thank you for sharing your view on the Monaco. I've had mine since 2003 and I'll never wear another watch. Finally had to replace the leather strap a year ago--it's major disadvantage ($399!) as you say, but I'm not the kind of person who can wear a metal bracelet.